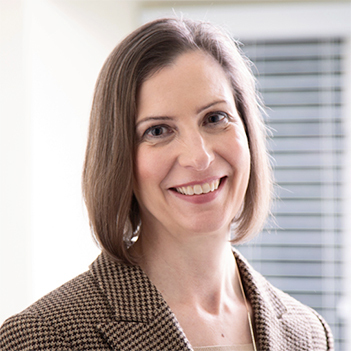 Katherine Meehan, a partner with Media-based Raffaele Puppio and who's practice focuses on school law and government services, talks with PIVOT Today about growing up in Connecticut, moving to Delaware County, attending Villanova University School of Law and her favorite weekend getaway. Katherine Huff Meehan is my full name. I do prefer to go by Kate. My parents had a deal that Mom would name the boys and Pop would name the girls; Pop won 3-0. I think he just liked the name Katherine. I was born in Willimantic, Connecticut and grew up in Mansfield Center, Connecticut. Mansfield Center, Connecticut was very rural. We lived at the edge of a state park, so as kids we spent hours in the woods, skating on the lake when it froze, biking, and fishing. Our house was a converted summer cabin that my father fashioned into a farmette – we raised various animals and grew vegetable and flower gardens. As a teen, I wanted to be closer to the action of a city, but as a parent I see it as the ideal place to raise kids. Now, of course, it is a very trendy, organic and health-conscious area to live! I always tell people that Delaware County is the ideal place to live – we are close to two major cities, the beach, and the mountains, and you don’t have to drive far to be in the country. Our weather is decent and New Jersey often buffers us from bad storms. I have always appreciated how friendly people are in this area. I moved to Delaware County in 1988, and right away noticed a difference from the more stoic sorts you encounter in New England. My father was a college professor who was also an active volunteer fireman and EMT; I consider him a Renaissance man since he was interested in a wide variety of things. My mom was a housewife and later a secretary, but her real passions were music (she was a singer) and traveling all over the world. My first job was cleaning the home of a local caterer. She later trusted me with all areas of her catering business, including cooking, prep and catering parties – it is very hard work! I attended Ithaca College in New York where I earned a bachelor’s degree in politics with a minor in sociology. I was interested in television and radio, so my father suggested Ithaca’s very strong program. After getting a taste of it freshman year, I decided it was not for me. But I did enjoy my politics major, which seemed a natural segue to law. I went to Villanova University School of Law, right here in Delaware County. I decided on Villanova because it is a strong and reputable school. I was not actually seeking to practice education law, so it might have been divine providence. I have been fortunate, though, because it is a good fit for me: getting involved in a myriad of issues, working with caring professionals, and ultimately working to do our best for children. High quality, free public education is probably the most important service of our government because it is a long-lasting benefit to all of us that sustains and improves our society. The vast majority of education professionals I encounter and work with are in it for the kids and are passionate about providing the best they can for each student. That attitude inspires me to work alongside them with the legal piece. I’m an active member of Media Presbyterian Church where I have been a member for 24 years and have had the privilege of serving as an elder, deacon, and on several different committees and events. This involvement has enabled me and my family to be part of a supportive and positive community that exists to serve God and others. Our work has included local missions, such as food banks and home repairs in Chester and Media, as well as traveling to the poorest parts of Appalachian North Carolina and West Virginia to do similar work. Absolutely, teaching and mentoring are very important to me. We learn by teaching, and by listening to each other. No one has all the answers, and learning should be a lifelong process. In my years of practicing in Delaware County, I have observed, admired, and learned from the styles of many terrific attorneys. I am fortunate to practice with top notch attorneys who are not only competent and fair minded, but also practical, sensitive to the needs of their clients, and always driven by the desire to do the right thing. Teikoku in Newtown Square is my favorite restaurant in Delaware County. Their cuisine is imaginative and delicious with beautiful presentations; I’ve never had anything that wasn’t good. My favorite weekend getaway depends on the season. What I like most about this area is that we have access to so many different locales – shore, mountains, country, city – so having that wide range of options feeds my inner ADD personality trait. The Lancaster area is great in the spring, summer and fall; the Poconos are beautiful in any season, and I like the Jersey shore in the summer and winter. One thing I would change about the Delaware Valley is having more safe biking and hiking trails. The Chester Creek Trail has been a great place for people to bike, run, or just have a good trek, but it is not super long and is already very popular and frequently crowded. The best piece of advice I have ever received is in the context of parenting: to set close boundaries with children when they are small, and as they grow, expand those boundaries to allow them to learn and make mistakes. Of course, the boundaries can tighten up again for a time when they begin to have problems or need correction.